Yesterday, on a quest to explore Sebald’s links with Alain Resnais’ L’Année derniere à Marienbad (for another blog), I noticed in Austerlitz the name Marie de Verneuil. She is the friend with whom Austerlitz has been in correspondence since his time in Paris, and who invites him to accompany her on a visit to Bohemia, to do some research on the spas of Europe (thus Marienbad). 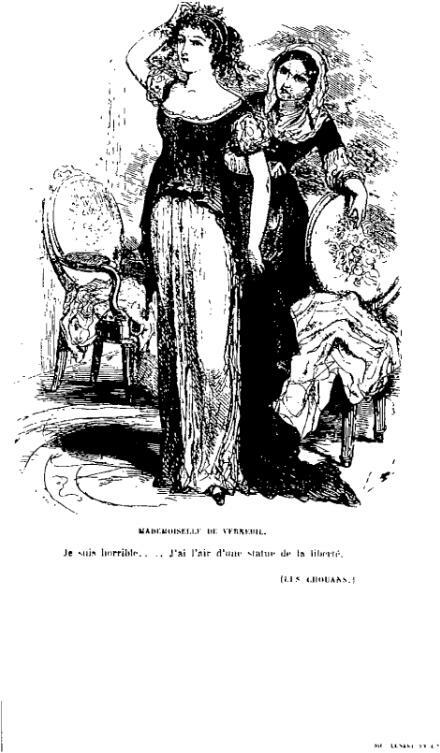 It would not have struck me the last time I read Austerlitz, but Marie de Verneuil is the heroine of Balzac’s first non-pseudonymous novel, Les Chouans, a historical romance based on the counter-revolutionary rebellions in Brittany. Marie is a spy, in the employment of the revolutionary national government, whose mission is to identify and entrap the young leader of the rebels, the Marquis de Montauran. They fall in love, and the vicissitudes of their doomed romance mirror the ebb and flow of the fortunes of the opposing armies as towns change hands over and over again. This is not the Balzac of the great Comedie Humaine novels. Heavily influenced by both Sir Walter Scott and James Fenimore Cooper, its interest primarily lies in the way in which Balzac personifies and mythologises the landscape of Brittany as disorientating and treacherous, savage and primitive, and the way in which despite fairly obvious Republicans sympathies he enlists our emotional sympathies with Marie and the Marquis and their cause, as doomed as their romance. But what does all of this have to do with Sebald? Balzac has an important role in Austerlitz: ‘the fifty-five small volumes of the Comedie humaine bound in carmine red’, in one of which, Le Colonel Chabert, Vera finds two small photographs, possibly placed there by Agata just before the Germans marched in. And Austerlitz, seeking respite from his frustrating and obstructed searches in the Bibliothèque Nationale, begins reading Balzac, starting with Le Colonel Chabert. Chabert is a ghostly figure, left for dead on the battlefields of Eylau, recorded as dead in the histories of those wars, and now returned, ‘risen from the dead, so to speak’, to reclaim his identity, his inheritance, his wife. Chabert introduces himself as ‘Colonel Chabert, who died at Ehlau’, and tells of the pit of corpses in which he had been thrown after the battle and from which he clawed and tore his way out. For Austerlitz the book ‘reinforced the suspicion … that the border between life and death is less impermeable than we commonly think’. When I first read Chabert, I thought of the deportees returning home from the camps, appearing on the streets where they had once lived but now as ghosts, revenants, shocking and uncomfortable presences amongst the living and, as revenants so often are, goads to their consciences (think of Banquo, or Jacob Marley). Chabert, whose memories are shadowy and often confused, still hears at night the groans and sighs of the wounded and dying, just as the deportees, returned to life, brought with them the nightmare that they had escaped. And the dubious welcome he received was shared by some who found their apartments now occupied by neighbours – who sometimes justified their continued occupation on the grounds that the sole survivor of a deported family would not now need all that space. But what of Marie de Verneuil? Pure coincidence? The only reference I can find which acknowledges the source of the name simply says that Les Chouans is never mentioned by Sebald. So did Sebald recall the name from his reading of Balzac without it having any particular significance to him? That seems improbable. Every name, every place, every reference in Sebald carries the weight of so many connections that I cannot believe this carries none. And yet it’s hard to see the link. Maybe if I return to Marienbad, I might find something there.